1 Two Pound Carton dehydrated Chef's Cut Onion is equivalent to 20 pounds fresh raw onion. 1 tablespoon dehydrated Chef's Cut Onion is equivalent to 1/4 cup fresh, chopped onion. Save Time with McCormick Chef's Cut Onion - No Peeling, No Slicing and No Chopping. 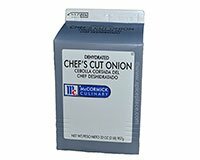 Save Money with McCormick Chef's Cut Onion - No Waste, No Spoilage, No Storage Problems. Use in Soups, Hamburgers, Dips, Meat Loaves, Stews. Sauces, Hot Dogs, Tacos, Stuffings, Seasoned Vegetables, Salads. For most recipes ... add Chef's Cut Onions right from the container. No preliminary soaking is necessary for soups, stews, gravies, sauces, Swiss steak, casseroles or other recipes high in liquid. To use uncooked ... Cover with cold water and soak 20 minutes. Drain and use in any recipe just as you would use fresh onion. To Grate or Mince ... Crush the dry onion pieces with a rolling pin.